“I don’t know who any of you are. I haven’t got a clue,” Marco Pierre White tells the 10 celebrities before him on Hell’s Kitchen Australia. Well, that makes 2 of us, Marco. Apart from a handful of folk, I needed screen titles to help me identify who many of this lot were. Ironwoman, NRL champ, Olympian, British Reality Star ….ok if you insist. It sort of begs the question: if a TV network & production company can’t drum up enough recognisable faces, why not just go with non-celebs instead? The US edition has run for 16 seasons with competing pastry chefs, sous chefs, caterers, deli managers, pizza chefs and more. Instead we get “stars”, most of whom appear to be waiting for their next gig, who freely admit they can barely cook an egg. This strikes me as a waste of Marco Pierre White’s time. After all he’s known for demanding nothing but the best. So why would he fly all the way to Australia to front this show, given he’s told us in the past that MasterChef Australia is “without question, the greatest cooking show on earth?” I guess given he hosts this in the UK, we have our answer (trivia: he also fronted Aussie format The Chopping Block in the US). Cooking an egg is the first challenge in this apparent test of skills, which wouldn’t even make the auditions of My Kitchen Rules. But this lot are already a hot mess. The Chase’s Issa Schultz, The Bachelorette‘s Sam Frost, WAG Candice Warner are about to drop like flies as the “very phenomenal chef” (to quote, Ms. Frost) Marco peers down at their handiwork. If there is any fun to be had from this exercise I suppose it is in watching them squirm outside of their cliche ‘comfort zones.’ That could put Hell’s Kitchen Australia into the “trash TV-so-bad-it’s-good” basket but I suspect the very idea of that is an anathema to our imported ringmaster. The format for this involves a skills challenge and service challenge with one poor mug sent into the “last chance cook-off”, to be joined by 2 more across the week. A field challenge service is also on the menu. At the end of it all is $50,000 for their desired charity. But there was also some serious smoke and mirrors going on. In the service challenge, where two teams serve 60 diners, one contestant tells us, “Marco’s already done all the elements, so we only have to heat them and add the egg.” WTF? Where was the pastry cooking for these entrees? Delivered by Uber Eats? That effectively means we are watching struggling celebrities assembling dishes in between Marco yelling “Where’s my fish, where’s my fish?” So which part of this Reality is actually real again, I’m confused? And let’s not get started on those exterior shots of a villa-like building which are doubtless nowhere near the studio interior. Seven does this all the time, along with resisting a 60 minute episode. The other drama that unfolds in the first episode is former politician David Oldfield clashing with Real Housewives Pettifleur Berrenger, whilst telling us he is the victim of housewife ‘abuse’ from wife, Lisa. If he’d seen the show, he’d know we all are. The one saving grace here is that Marco is knee-deep in this format, unlike the criticisms levelled against Adriano Zumbo in Seven’s last failed attempt at a cooking show. He stalks the supermarket-branded kitchen wielding his knife in such a way that it will probably make this unsafe for children. 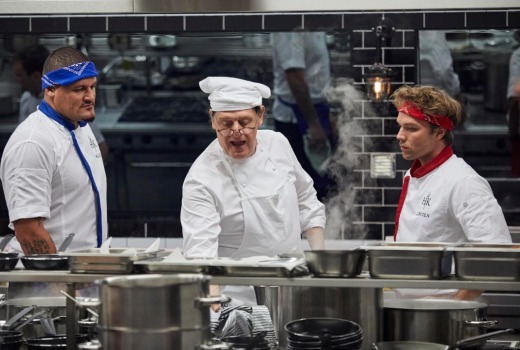 I’m sure for those who last the distance there will be growth in the 10 celebs’ skill-base but right now Hell’s Kitchen Australia lacks the authenticity required of committing to a stripped primetime format in what is already an over-crowded genre. Step away from the benches. Hell’s Kitchen Australia premieres 7pm Sunday on Seven. Sounds like the same people that did the casting for Dancing With The Stars, maybe 2 credible celebrities in the whole mix! Interesting concept but what happened to Australian food standard requirement. Eg..
I’m done….I also, have been a long time fan of Marco….but this is more like a comedy……..
Well I will give it a go. Still have no idea why 7 went with a celeb version. Although at least some charity will benefit with the winner. But it will be interesting to see how Marco goes. Im sure he is wondering why he ended up with some of these people who have no idea. At least get some celebs that can cook the basic things. Watched the preview with an industry friend – I remember Marco talking fast in Masterchef – yes Marco yes Marco yes Marco – quickly quickly quickly – this show I recommend you play on 1.5 speed if you can as everything is slow. And… Now…. the moment … has arrived…. to….. reveal….. the scores.. (longer pause) … xxxx scored …. (pause, heavy music)…. etc. It’s ok as a show in the background but wouldn’t sit and watch it. 1 out of 5. All channels have flops, but hats off to 7 for trying different formats and if they suddenly get one right will the tables be turned. This codswollop is great as multichannel filler but not on the flagship 7 wavelength. I wonder if there will be any heads on the chopping block if this latest cooking format fails, especially with a cast of not-so- fabulous nobodies… I honestly can’t remember the last “hit” Seven show…but there’s been a cavalcade of expensive flops – Restaurant Revolution, The Big Adventure, Zumbo’s Just Desserts ( a self fulfilling prophecy if ever there was one ) , Yummy Mummies, The Big Music Quiz , Behave Yourself !, Kiss Bang Love, and the whimpering end of The X Factor and tailing off of MKR’s long ( and well deserved) dominance … Doesn’t the buck have to stop somewhere ? And yet they are winning the year. Ten aren’t obviously taking any chances, simulcasting Survivor over 3 stations on Sunday………. I think Marco is a great pick for head chef, but not the cooks. They should have been pros or up and coming chefs as per Masterchef: The Professionals (UK version). You’re on fire with your reviews lately with this and Yummy Mummies, but they rightly so deserve it. I had low expectations for this series, and this confirms my thoughts. I’ll give it a miss, like I do with of Seven’s other “reality” shows. 1 episode per week is plenty. Great review, David. Confirms my suspicions after watching the promos. My only question is how you managed to give it 2 stars and not one? This review confirms everything I feared. I’d be hell keen if it was – as you say – authentic, non-celebs with some skill and drive to prove themselves with a worthy prize at the end for their efforts but as it is, I’ll avoid. Don’t watch much reality TV but want to give this a go as I love both Issa and Deborah so hope it turns out to be good. Haha Secret Squirrel you’re right. There are some predictable posts on here some days. Not surprising that AAQIB would give this one a miss. But I also had a feeling that MM would give this 7 show a go ? As far as I am concerned this is a waste of air time and I am disappointed that such a famous Chef has agreed to do it…thank you for the review, I wasn’t going to watch anyway given that it is not Hells Kitchen as I know it but good to see someone of your caliber doesn’t know who most of the ‘so-called’ celebrities are either ! A shame, as I have admired and followed Marco’s career for almost two decades now, and until recently, he seemed high on integrity. His stint as television chef seems disingenuous as he long railed against celebrity chef culture. This will fail, due in large part to the zelebrities and the lack of appetite for shouty chefs – 10 years too late (I remember wall-to-wall Ramsay). “zelebrities” – Love it !!!!! If there’s one change I’d love to see happen to all of our reality TV shows, is for them to pull back their episodes to 60 minutes each. I think it would make all of them so much more watchable and enjoyable.